Once merely sleepy countryside, Hong Kong's New Territories are now absorbing the region's growing population with residents counting more than 3 million. Although still overlooked by many tourists, the scenic countryside around Hong Kong has a diverse landscape that ranges from mountains and meadows to towns and small cities. 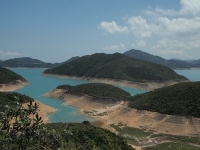 One of the most popular settlements to visit is Sai Kung, which contains a range of amenities and is a good gateway to the wilder areas. Sha Tin is also worth visiting for the Hong Kong Heritage Museum, 10,000 Buddhas Monastery and popular Sha Tin Racecourse. Tai Po offers the Man Mo Temple and Waterfront Park. Eating out in the New Territories means authentic Cantonese cuisine, well-suited to adventurous palates. The Tai Po Hui Market has a number of small stalls, while Hang Heung is a well-known Chinese bakery in Yuen Long. For more familiar or westernised food, Sai Kung has a number of foreigner-friendly restaurants and pubs. Shopping is less of a focus in the New Territories, but Tai Po and Sha Tin have enough shopping malls to satisfy bargain hunters.